I was delighted when Paul Karau, the publisher, asked me to continue in the role of editor and felt that my editorial should begin by thanking those readers who have said how much they enjoyed the previous editions. I was most interested to read Don Rowland's article about the Crewe Livery (see page 74), Research into the subject of the livery of LMS locomotives and later coaches and freight rolling stock marked the beginning of a number of publications that were written by members of the LMS Society and originally were for the benefit of railway modellers. In his article Don refers to different systems used in the paint shops and suggests that it was not part of a deep-dyed conspiracy that some authors suggest took place. When David Jenkinson and I were researching the development of the various livery styles used by the company, I suggested that we should visit Derby and Crewe works to see what we could find out. We spent a day at Derby and the following day at Crewe. It was most interesting and what we were told can be summarised as simply that the men at Derby explained why their method was the best and that Crewe were not as good as they were, and at Crewe we were told the reverse that their method was much better than what was done at Derby. It was clear to us that there was no love lost between the two works and the date of our visit was about 1966 - forty-three years after the LMS was created. What more can I say? 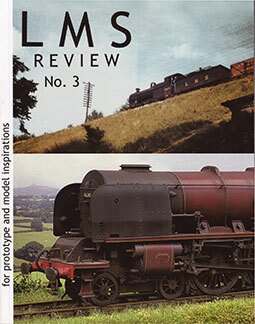 I believe there is a good reason for including articles about models of all forms of railway equipment, and in this issue we have featured a number of vans. As the author of some books about wagon stock, I know how difficult it is to find suitable pictures of the goods stock that was used by the various railway companies and the nationalised British Railways, so we would always be pleased to hear of any previously unpublished views of ordinary LMS wagons, not least because of the paucity of known running numbers. I believe that now the only way we can enjoy the sight of long-lost locos and stock is through accurate models and that the only way we can show how the various British Railway companies were operated is through the use of such models. This title will continue to be an occasional publication and the date when the next one will appear will depend on how quickly this one sells. I believe that the mix of articles should include some record of how the railways were operated, and a good idea of this will be found in the article by John Wood entitled 'Rugby Control'. While the operating side is popular and in many respects most helpful for railway modellers, the 'behind the scenes' can help readers understand more about why things were done the way they were. Site contents Copyright © Cygnet Magazines Limited, 2014-2019. Articles should be sent to LMS Review, Cygnet Magazines Limited, 1-3 Hagbourne Road, Didcot, Oxon, OX11 8DP. Please include SAE with all articles and illustrations submitted for return in case of non-acceptance. Authors must have permission to reproduce all photographs, drawings, etc, submitted.